Our superb 4 Bed 3 Bath Home Sleeps 8 in comfort. Split floor plan offers complete privacy for everyone, with the four bedrooms arranged around the outside of the living areas, with each bedroom next to a bathroom. Over 2100sq feet fully air conditioned with tile to all living areas to keep cool whilst all bedrooms have fitted carpets for comfort. Vaulted ceilings & fans help to keep house cool. Free wireless internet full cable package 42 inch Plasma TV with DVD Player, and a further 2 flat screen TV's - one in master bedroom. In the second bedroom there is a mini hi-fi system. Fully fitted and equipped kitchen with microwave, dishwasher, US sized fridge/freezer with ice maker, oven, coffee maker, waste disposal, toaster and all the plates cooking utensils pots pans and crockery you need. Laundry Room with family sized washer & separate tumble dryer iron & board. All bed linen towels cooking utensils provided everything you need - fully equipped! Master bedroom has 5ft bed with extremely comfortable pillow top mattress and brand new bed clothes. Large walk in closet and full set of high quality wooden bedroom furniture. Second bedroom has 5ft bed and brand new bed clothes, sheets comforter etc. Also has large walk in closet with bedroom furniture and separate night stands with lamps. Both living rooms have leather furniture and there are 2 seperate indoor dining tables as well as a breakfast bar. Outdoors in the pool area is a further large dining table with 6 chairs and room for 8 people to eat. Swimming Pool is ideal for families use. Has shallow end with easy to access steps. Pool heating is available at a small extra cost although not really needed in June July August and September. Pool is screened by hedges and bushes for full privacy. Pool deck has more than enough room for sunbathing with undercover area for dining and shade when required. Wonderful Golf Course location situated back from the fairway super course great views with green fees only $25 including golf buggy and half sets of Golf clubs in the garage for guests use, free of charge. Upgrades for 2017/18 include new fridge with ice maker new washer & dryer, new air conditioning system, new bedroom carpets, full exterior & interior redecoration, new dining suite indoors, new pillow top mattress to master bed, new bed linen new towels, furniture pictures, rugs, curtains, electrically operated garage door opener. We also supply both a gas and a charcoal BBQ for our guest's use. Unlike many other owners we do not charge for using our BBQ's. All we ask is that they are left clean after you use them - we would also like to point out that they must not be used in the house or garage - strictly only in the back garden. We also supply a complete set of BBQ tools and utensils - also free of charge. We have a cot, a crib, a high chair and a pool fence all available if required at no extra cost. Great beaches on our doorstep at Hudson for sunsets and Alfred McKethan Park [Pine Island] for shallow warm water with golden sands, covered cabanas free showers and all day car parking. Also visit the newly opened SunWest Beach only 4 miles north on US19 where you will find clean white sandy beaches, shallow water, lifeguards, giant inflatable slides in the water for children, as well as Jet Ski hire. Also there are showers, covered ares a small shop and a food outlet. Finally there is the world famous Clearwater Beach approx. 45 mins away with all the amenities as well as the magnificent bridges you drive over on your way there. We often catch a cruise from here to see the Dolphins - breathtaking! Also the piers are well worth a visit here to see all the local arts and crafts - many for sale at very reasonable prices. Supermarket 24hour Pharmacy 24 hour gym and Gas Station less than 1 mile. Great shopping nearby at Gulf View Mall, Citrus Mall (our favourite), Countryside Mall south on US19 has ice skating, The Shops at Wiregrass and International Mall in Tampa. Superb range of restaurants all within easy reach of our home and include Bonefish, Catches and Red Lobster for great seafood, Longhorn, The Outback, Chillis and Sam Seltzers for great steaks and ribs etc., Applebees is a really nice neighbourhood diner with a very friendly feel and then there is Dennys and I-Hop for breakfast as well as Marcello's on our local parade of shops a very good Italian Take-Away. There is so much more great food nearby - too many to list! We have been coming to Florida as a couple and now as a family for the past 25 years and are still as much in love with the place as we ever were. We are always excited to visit and love to plan each trip together and then really look forward to coming each time we visit. We have often brought friends and other family members with us and everyone has been taken by some or all of what Florida has to offer. There really is so much to do and see - all you have to do is ask and you can tap into our experience of everything that the local area has to offer. We live in the UK in a village in rural Norfolk. We have always lived near the sea and have always enjoyed living by the coast and so Florida's Gulf Coast was the natural place for us to buy our holiday home. The weather is always fine, the local people are very friendly and we have all the advantages of staying in a home from home. We have got to know some of our neighbours along our street and have made friends and contacts in and around the area that are always on hand to offer help and assistance to both ourselves and our visiting guests. Our property managers, Sue and Steve, live nearby and are on hand to give you both a friendly welcome and any help or advice you need to help you enjoy your stay. They are very reliable and know the area extremely well. Situated on the Gulf Coast we have found the area to be quieter and more relaxed than the more commercial East Coast and Orlando/Kissimee areas. Here on the Gulf we have the best of both worlds; there are great beaches nearby (SunWest and Pine Island Beach being our favourites) and easy access to attractions with Busch Gardens and Adventure Island among our favourites and both less than 45 minutes away. A great way to spend an evening is to have a BBQ at the house and eat outdoors on the pool deck - a great place to relax and unwind after a hard days shopping! There is great shopping locally at Gulf View Mall and along US19. Travel a little further and Citrus Mall (25mins drive) and International Mall in Tampa (40mins drive) have all the shops you could wish for - as do 'The Shops at Wiregrass' - a more traditional high street type layout with numerous shops, restaurants and cafes - retail heaven! For parkland walks and nature trails there is JB Starkey Wilderness Park - a great area for picnics and cycling too. Also there is the amazing Weeki Wachee Springs - a superb warm water natural spring that can be canoed along for its entire 6 mile length - great for viewing Florida in the raw and all its amazing wildlife including Manatee, birds, turtles etc. Why not visit nearby Tarpon Springs where you can arrange boat and fishing trips as well as Dolphin Cruises and even snorkelling or indulge in fabulous traditional Greek pastries and strong coffees in authentic Greek cafes. North on US19 lies Spring Hill, a vibrant town where you can explore shops and visit Pine Island Beach (a State Park also known as Alfred McKethan Park) with its sandy beaches and shady picnic areas. Here you will also find car parking, showers, toilets, outdoor bbq's and a small shop to buy drinks and snacks. Further afield in Tampa you can visit museums (such as the amazing Museum of Science & Industry on East Fowler Avenue) , art galleries and of course the fabulous Florida Aquarium - a must see for children and adults alike. A little further afield is the Salvador Dali museum and gallery in St Petersburg, a fascinating day out. Or just ask us - we are more than happy to talk about all the attractions, facilities, beaches and leisure activities we have discovered on our many trips to this part of Florida! We live in the UK in a village in rural Norfolk, not far from the city of Norwich. We have always lived near the sea and have always enjoyed living by the coast and so Florida's Gulf Coast was the natural place for us to buy our holiday home. The weather is always fine, the local people are very friendly and we have all the advantages of staying in a home from home. There are so many amazing features and benefits when choosing our home. The house was made for families and groups of people wishing to stay together. The internal layout of the property is perfect with each bedroom next to a bathroom for convenience. All the bedrooms and bathrooms are arranged around the main living areas - this allows everyone their own space and privacy whilst providing plenty of separate areas to meet up, relax, eat or just hang out and watch TV. The house itself is very spacious, has high vaulted ceilings to keep it cool with plenty of parking out front and a large double garage so that vehicles may be stored and kept cool overnight. Outside there is a fabulous pool terrace with plenty of room for outdoor dining, sunbathing or simply looking out over the neighbouring golf course. It feels like you are in a park due to the rolling grass fairways and numerous birds, squirrels and other wildlife passing by. The house itself is less than 1 mile away from a Supermarket, and a Gas station as well as pharmacies, takeaway restaurants and only 2 miles from the nearest beach. However as we are situated in a quiet no outlet (cul-de-sac) road the area is quiet, residential and the neighbours are friendly. All bed linens in all bedrooms provided with comforters on all of the beds and cotton sheets as well as additional bedding in the unlikely event of a cold night! Full sized washing machine and separate tumble dryer in the laundry/utility room. Separate plastic sink is ideal for rinsing through sandy beach costumes or towels prior to washing or tumble drying. Has remote controlled electric doors. Doors can also be separately locked from the inside. We have full internet access throughout the house and around the pool area and this is password protected and is free for all of our guests to use. Recently upgraded for a much faster speed. We have a large number of towels provided for use in the house and in the pool area. full sized modern dishwasher with timer and a good variety of programs. New machine so is quiet and can be used day or night without disturbing guests. full sized oven with all the cooking utensils, casserole dishes and baking trays you will need. Oven has self clean facility. again quite simply everything you could possibly need for whatever you are cooking or eating - more than enough even for 8 people! There are in fact 4 separate dining areas in the house - 2 full sized both seat 8 with one indoors and one by the pool plus a smaller 4 seater table and a 4 seater breakfast bar area indoors. We do have 2 half sets of golf clubs in the garage with golf bags, balls and lots of other golf bits and pieces. We are happy to allow our guests to use these free of charge. We have a heated pool available at the house. The pool can be accessed from steps at both ends. There is a pool safety fence available for our guests to use free of charge. Pool is screened & private. We had a wonderful time at this home for the 10 days we had in Hudson. Couldn't get it for 2020 but hoping maybe 2021. Love the area. Beautiful home with beautiful furniture BUT needs a good professional cleaning and installation of exhaust fans in bathrooms to control moisture which results in mold/mildew in showers and on window frames. Ventilation ducts require a professional cleaning as there is an earthy smell in the house. Poor air quality. Had to leave two weeks early as sinuses problems were getting worse by the day. Owner was understanding and gave me a refund for the remaining time. However, our dream vacation was ruined! It was a real shame for this lady that she felt that our house was somehow contributing to her sinus problem. Nevertheless we arranged for a local specialist contractor to call at the house and asses the property interior for mould, mildew and damp. His report came back as all clear - no problems to report, no action required. At that point you asked to leave the house and asked for a refund which we duly gave you. Delighted you liked the furniture! Our home is properly managed and carefully taken care of. 91 reviews stretching back over 10 years and averaging 4.8 out of 5 attest to that. I cannot speak highly enough of both the villa and the owners. Very well maintained and equipped house, everything you could want and more. We have stayed in many houses in Florida over the years but nothing comes close to the standards set here. Property managers very helpful and knowledgeable as they live close by. Owners were very accommodating and helpful and very quick to respond to questions. The local area is very well served by shops and restaurants. The pool is warm, private and a good size with plenty of room on the deck for sunbathing and outdoor dining. We literally have nothing bad to say about anything. Will certainly be coming back again next year. Beautiful home and perfect location. Well maintained home in a quiet subdivision and a perfect house for our adult children to stay in while visiting us for the holidays. Thank you Valerie. Great to hear that everyone enjoyed their time in our holiday home. Unlike the majority of our guests you have something similar to compare us with, living as you do on the opposite side of our division. We will pop round to see you next time we are in Florida. I know you all enjoyed the quiet location and the swimming pool as well as the views out of the back of our home, looking out over the golf course. I was glad to hear that Sue was able to find the bag that your daughter left behind. 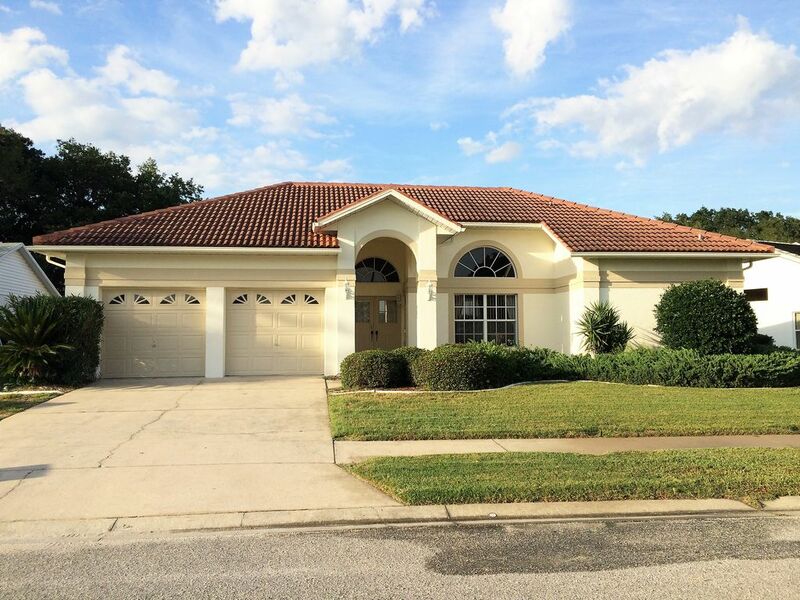 We stayed at this wonderful home in Hudson Fl for two weeks in November 2018. we found the home to be very large and everything we needed was provided. The area is so convenient for many restaurants and only approx. and hour away from Tampa and Clearwater. We took advantage of visiting the Hard Rock Casino in Tampa and going to many restaurants in Hudson as well. Even our dog enjoyed the visit. the neighborhood was so nice that we walked her all around and met many of the neighbors. Sue the homes manager was so helpful to us. Our car needed a repair and she gave us the name of an excellent mechanic who was great and very reasonable. Thanks Sue and James for our wonderful vacation. Thank you for your review, we are delighted that you have had such a great stay and that you enjoyed the house so much! As you have found out there are a huge range of superb restaurants within a short distance of the house. You really can dine out every night of a 2 week stay and enjoy something totally different each time. As for Tampa there is plenty to do and see in this fine city from art galleries to museums, from fine restaurants to casinos and from night clubs and bars to theme parks and amusements. If you come back to the area it is worth visiting Ybor City a lively suburb of Tampa with bars, clubs restaurants etc. (For anyone reading this review please note we no longer allow pets to stay with us). Our stay at Peaceful Villa was quite simply wonderful. So much space and oh so quiet, it was just what we needed after a week spent visiting the Theme parks of Orlando !! The Villa has everything you could possibly need and much much more ... the comfiest of beds with beautiful linen, lovely fluffy towels, sumptuous sofa perfect for settling down to watch TV, relaxing pool area over looking the golf course, every piece of kitchen equipment you can think of and then some. Sue & James have truly thought of everything to ensure a perfect stay. Delighted to hear that you have enjoyed the villa and had such a great time. We are also pleased that you found everything to your liking especially as you are experienced travellers. We are always adding updating and improving our holiday home and it makes everything worthwhile when we get such wonderful feedback. We hope to see you back someday? Our home is situated on the beautiful Fairway Oaks Golf Course with greens fees of $25 per person including golf cart. Hudson Beach less than 3 miles away has water sports, boating and fishing trips, not to be missed fabulous sunsets as well as outdoor dining on the beach at Sam's Bar or the more formal Inn on the Gulf. Great restaurants and shopping within 10 to 15 minutes drive along US19. Top quality shopping in superb surroundings at Citrus Park Mall approx 25 mins drive and at International Mall approx 35 mins drive. Or why not visit 'The shops at Wiregrass' some 30 minutes drive with traditional high street lay out, free parking and a huge range of shops, restaurants and cafes. The local area has some of North America's best beaches inc. Pine Island Beach, also known as Alfred McKethan Park, Caladesi Island a wonderful nature reserve with beaches - accessed by a ferry service, or the world famous Clearwater Beach to the South approx. 35 mins drive. On the way stop off in Tarpon Springs fishing and sponge diving village, on Alt 19. Superb Greek pastries, cafes and shopping on the dock side. Busch Gardens Theme Park with amazing animals and thrilling rides, our personal favourite, approx 40 mins away and next door to this is Adventure Island a superb water park with rides and attractions for all ages - fantastic fun! The Florida Aquarium in Tampa is well worth a visit or a little further afield there is of course Disney World. Or why not stay by the pool and use our outdoor bbq and enjoy the peaceful surroundings and unspoilt views across the golf course, a great way to unwind. Dining Out - you really can eat out in style every night of your stay and not have to visit the same place twice. For great seafood try Catches, Red Lobster or our favourite Bonefish - all within a short distance of our holiday home. For great steaks there is Longhorn and The Outback again only a short distance by car. For more casual dining there is Sam's literally on the beach at Hudson where you can sit with a nice drink and watch the sunset. For takeaway meals there is Marzellos Italian and a great Chinese takeaway - both on the parade within walking distance of the house. Also nearby are 2 pharmacies, a fuel station, a bank and Publix Supermarket. Golf: Our home sits back from the Links Golf Course giving nice parkland views whilst at the same time remaining private and secluded due to surrounding trees, bushes and shrubbery. The course is well kept and has a good variety of short, medium and long holes with some narrow and some more open spaces. I am a 24 handicap golfer and thoroughly enjoy playing this course. Green fees are around $20 to 25 per person per round and include an electric golf cart. As a nice alternative you can also play the 'sister' course Beacon Woods just a short drive away off Fivay. This course is also well laid out and well kept charging only $20 per round including golf cart. There are 2 reasonable half sets of golf clubs in the garage at the house if you don't have or can't bring your own clubs. These are free for all of our guests to use. In addition to this there are many excellent golf courses within a 10 mile radius of our house - please e-mail or telephone for details. A payment of a minimum of $300 is payable upon booking, the remaining balance is due 8 weeks prior to arrival. Failure to pay the balance within the period will entitle us to cancel your accommodation. Insurance can be obtained via your local agent to cover eventualities resulting in cancellation. In the event of circumstances beyond our control requiring us to cancel the accommodation (e.g. fire, flood, damage or other reason) we will make every attempt to find alternative equivalent accommodation. In practice it is unlikely this will happen or that we will be unable to offer a suitable alternative. However if that were the case all monies will be repaid. We regret we cannot be held liable for any other losses. If you cancel your reservation 8 weeks or less prior to arrival the balance paid cannot be refunded - please ensure you take out full holiday insurance. No liability is accepted for loss, damage or injury, howsoever caused, to you or your party or any other party whilst at the vacation property. We recommend guests have adequate travel and medical insurances. We will ensure the property is clean and tidy for your arrival. Please report any damage or problems upon arrival. Without immediate reporting we will not be able to resolve problem or make any refund. To ensure return of your security deposit please report any breakages or damages to our property managers, Sue or Steve. Please leave the property tidy.